Truth be told, I'm generally not a fan of water rides. Mostly because I don't enjoy walking around while soggy. So unless it's very warm, I'm not apt to go on one. That fact is multiplied when night falls, because I'm also generally not a fan of pneumonia. Still, that doesn't stop other guests from braving the splish splash of Splash Mountain in the evening. If you're a fan of the ride, nighttime is a great time to ride. The lines are short, so you don't have to wait the one or two hours that would normally be the case during daytime hours. Then again, if you catch something from the briar patch besides a Laughing Place, don't complain to me! 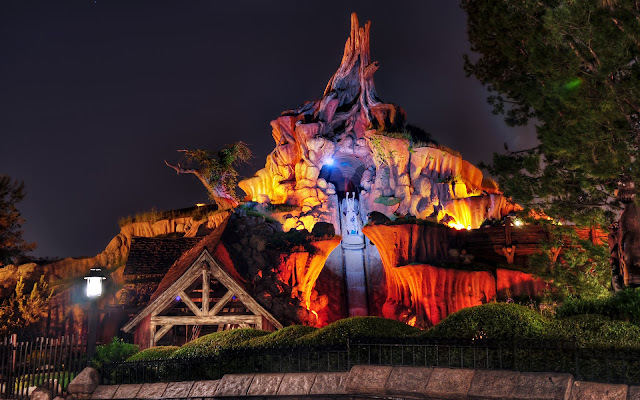 The strobe of the camera captures a log going down Splash Mountain in the later hours of the night.